There are quite a few different blues styles.This major style of lead playing is exemplified by players such as Freddie King, B.B. King and Peter Green. As a young man and aspiring blues player, I had a friend called Nick Pickett who was a blues violin player and guitarist with the John Dummer Blues Band. He toured with Peter Green and used to jam with him. Greeny's advice to him which he passed on to me was to "learn your majors"- in other words for some styles the minor pentatonic scale is not enough. So what scale am I using? The answer is that I'm not really using a scale to play this style - instead I use the minor pentatonic as a framework then add certain key notes dependant on what part of the 12 bar sequence I'm on. In effect I'm using a mixture of A Minor Pentatonic and A Major pentatonic but learning these scales probably won't help too much. The Mixolydian scale gets touted for this style but again it doesn't cover all the notes used and ends up sounding more like jazz than true blues. The great B.B. King readily admits he doesn't know much about scales - he just knows which notes to hit and when to hit them. This to me is the right way to approach this style. 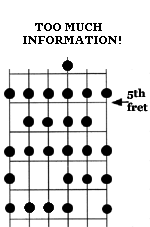 This fretboard diagram is a look at the notes I use around the 5th fret and is really just to illustrate the impossibility of fitting these into a scale. As we go through the tutorial I will show the various added notes and how to use them. I'll be using the Key of A throughout this tutorial but once you have learned the style it should be easy enough to play in any key. 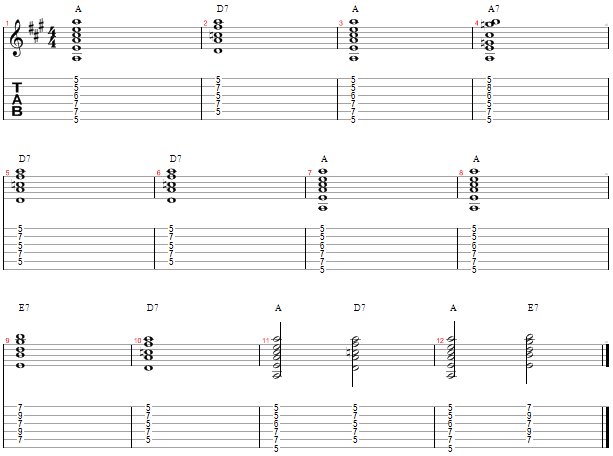 The video is just major blues style improvisation over a variant of the standard twelve bar chord sequence which I have tabbed for reference. I have also included a soundfile of the backing used for you to play lead over.